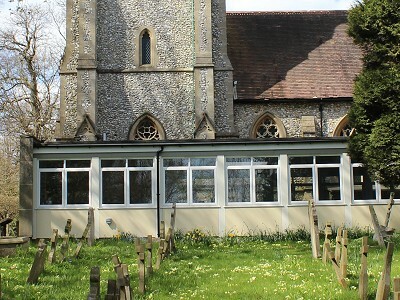 St. Mary’s Church Hall was built in the 1960s and provides a much needed community function in Caterham where there is a shortage of community facilities. The Hall was originally intended as a temporary structure with a 25-year life span, so it is now well beyond its best-before date. As a result, it was becoming very dilapidated and a few years ago it was decided to carry out an upgrade. We could knock the hall down and build a new one, but to obtain a new hall of the same footprint and in sympathy with the church building would have been be prohibitively expensive. Investigation by our architect proved that, although many of the window frames and external wall panels had started to rot, the structure was fundamentally sound and the life of the hall could be extended by around 30 years if renovated and modernised. This was completed in early 2012, providing us with a hall that is in a fit state of repair and safe for use. During Sunday services Junior Church meets in the church hall and afterwards tea and coffee are served there. It is also used to host social events for the congregation. 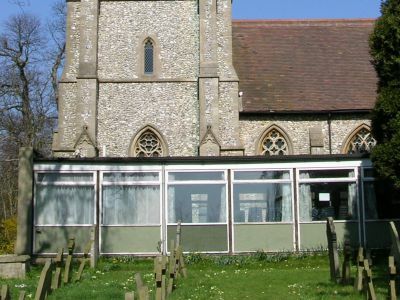 The church hall is used during weekdays and evenings for a variety of non-church groups, ranging from painting classes to mother and toddler groups, brownies and guides. It is also often hired for one-off events such as children’s parties and local meetings. The present regular use of the Halls is detailed here and at other times St. Mary’s hall, or the St. Paul’s Centre hall, may be available for hire. Hall Bookings can be discussed by phoning the Parish Administrator on Tuesdays to Thursdays, 9.30 – 12.00am. Anyone wishing to hire the Hall will be asked to sign that they agree to abide by the “Rules for the Use of St. Mary’s Hall”.